The Oktoberfest in Munich is the largest festival in the world, attracting over 6 million visitors each year. It all began as a horse race in October of 1810 for the royal wedding of Bavaria’s crown prince Ludwig to princess Therese of Sachsen-Hildburghausen. 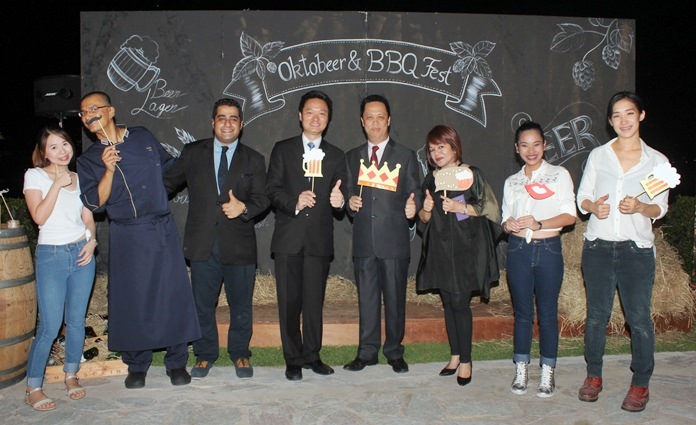 The management team, F&B Manager Akshay Prabhakar (3rd left), Larry Choi EAM (4th left), GM Neoh Kean Boon (4th right), and Vanjie Lauzon (3rd right), Director of Communications gather for the opening ceremony. Little by little, the festival grew to what it has become today, with new traditions developing along the way. The first mayor to tap the first barrel for the opening of Oktoberfest was Thomas Wimmer in 1950. The rest is history. Crowned Queen of the Oktobeer & BBQ Fest on opening night. 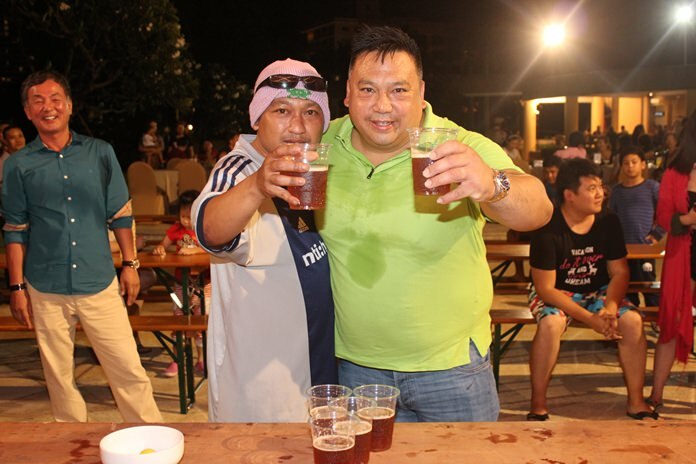 This tradition of food, beer, fun and games has travelled to every corner of the globe even landing on the shores of the land of smiles. 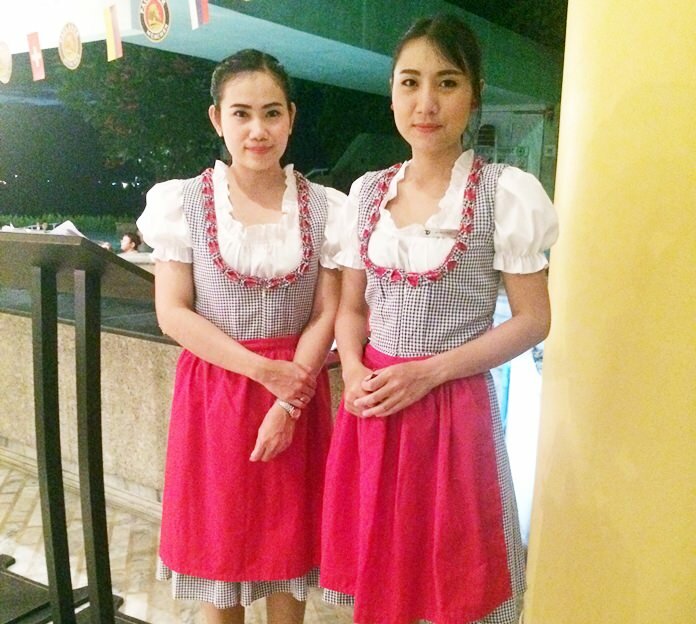 On Saturday October 1 the Dusit Thani Pattaya was abuzz with Bavarian damsels looking very comely in their traditional Drindls (Bavarian traditional dress) flittering from table to table ensuring that guests had a never ending flow of international brands of suds. But the star attraction was the draft Oktoberfest bier specially flown in from the world famous Paulaner brewery at Munich’s Nockherberg. 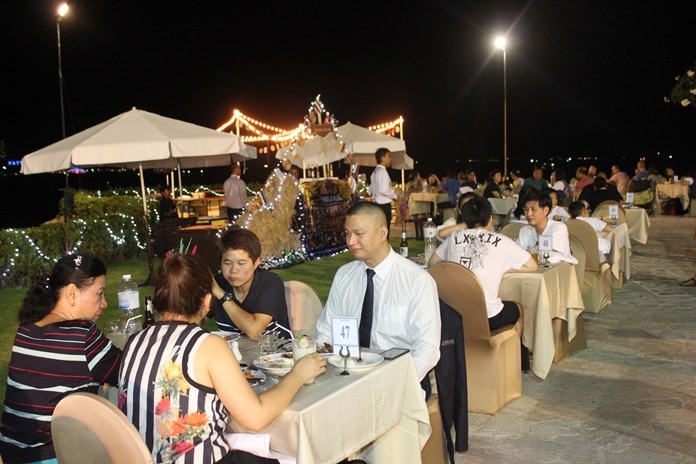 The celebration was kicked off by Neow Kean Boon GM of the Dusit Thani Pattaya with the symbolic “O’zapft is” as he declared the festivities open. Okto-fun for the whole family. Beer games and beer drinking music was played throughout the evening which had guests singing along and cheering each other. 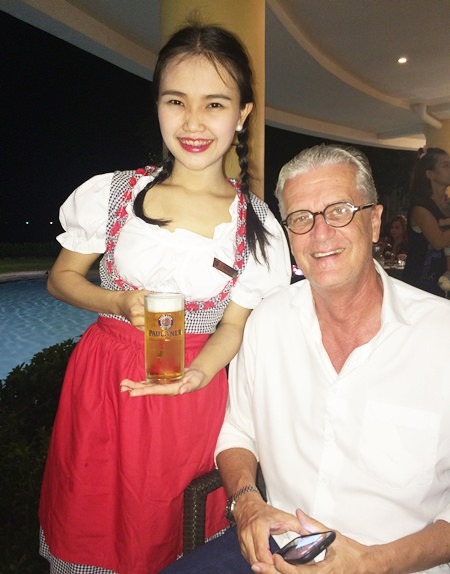 All props and decorations were sponsored by Paulaner Thailand which added Bavarian exclusivity and a touch of class to the whole atmosphere. Ambience at the festival site was cosy and friendly. Guests were given a lucky draw number to get a chance to win round trip air tickets for two to Hanoi courtesy of Thai Airways International. The drawing will be held on 29 October, the last Saturday of the event. 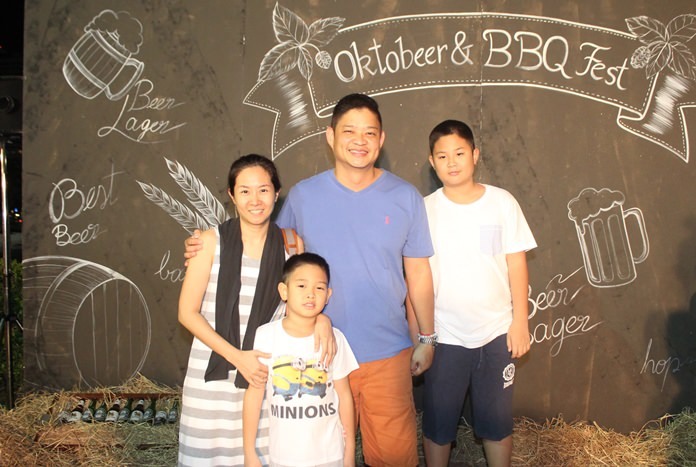 The Oktobeer and BBQ Fest will be held every Saturday throughout the month of October 2016. 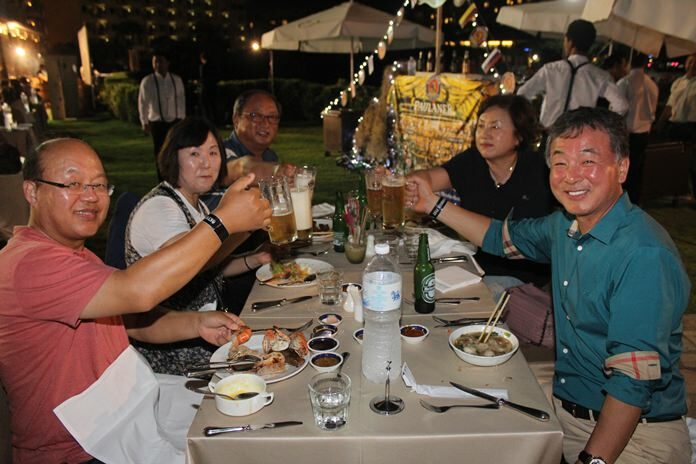 Cost of the buffet is THB 900++ per person whilst the free-flow of beer is THB 590++ per person. A la carte beer menu is also available. 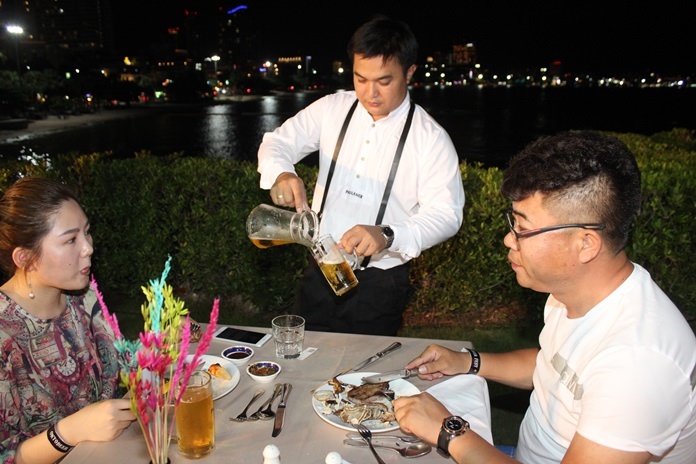 For reservations please call 03842 5611-7 Ext. 2149, 2150. 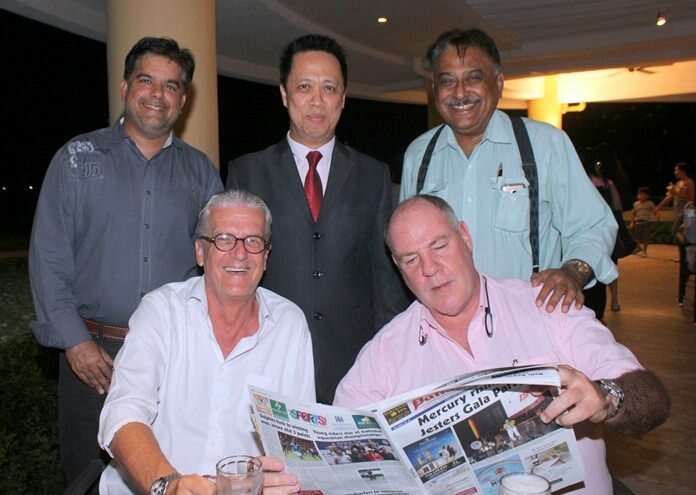 Neoh Kean Boon greets his special guests, Tony Malhotra, GM of the Scandinavian Village in Bang Saen, Peter Malhotra, MD Pattaya Mail, Joachim Klemm, Director of International Sales & Marketing, GO Property Thailand, and Philippe M. Guénat, CEO of Bakri Cono Shipyard who seems much occupied with the Pattaya Mail. Ein Prosit, ein Prosit, Der Gemütlichkeit. Romantic BBQ dinner by the sea as Paulaner flowed. A dirndl clad madl serves ein krug of the finest brew.